Lily says: From a string of librarian glasses to a quirky, vintage pair of cat-eye glasses and a simple perspex ring - glasses really are no longer confined to the face! Even the pair of actual glasses featured here would look perfectly at home simply displayed on a shelf thanks to their really unusal arms! There are plenty of glasses-related goodies available right now at quite resonable prices, so anyone can appreciate the iconic shape of the cat-eye or the NHS-Specials! The classic Tatty Devine spectacle necklace has been a favourite piece in my jewellery collection for several years now, but I am really tempted by that cat-eye ring! 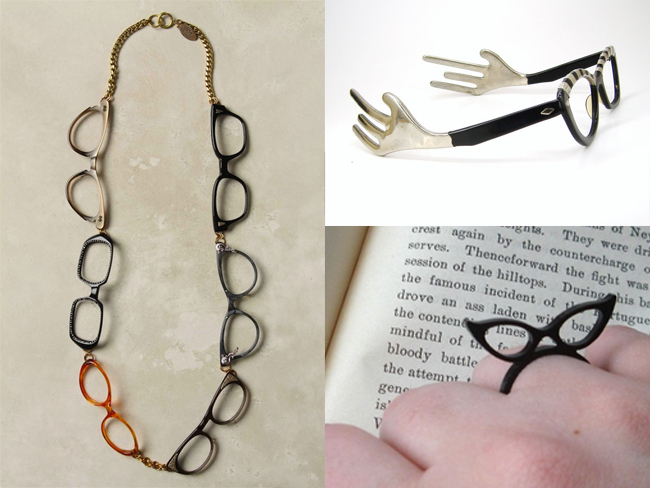 Do you have any glasses-related jewellery or stylin' spectacles?